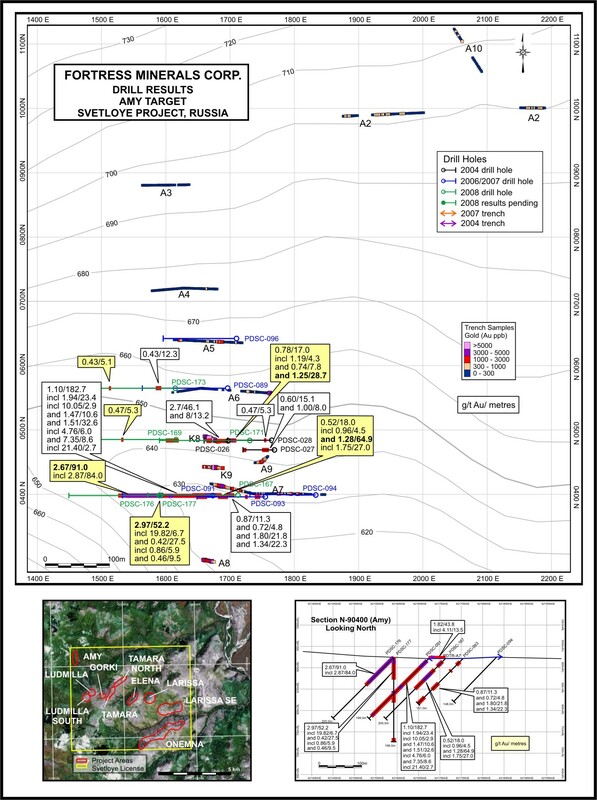 VANCOUVER, BRITISH COLUMBIA--(Marketwire - Aug. 6, 2008) - Fortress Minerals Corp. (TSX VENTURE:FST) ("Fortress" or "the Company") is pleased to announce results received to date from the 2008 diamond drilling program at the Amy prospect, Svetloye Project, Russia. Highlights from the six drill holes completed thus far at Amy include holes PDSC-176 that intercepted 91 metres (from 0 to 91m) grading 2.67 grams per tonne (gpt) gold and PDSC-177 that intercepted 52.2 metres (from 0 to 52.2m) grading 2.97 gpt gold. The Amy prospect is one of nine prospects within the Svetloye Project that Fortress is currently investigating. The majority of the Amy prospect is buried under soil cover. In order to effectively target the drill program at Amy, an extensive trenching program is currently underway utilizing three bulldozers and one excavator. Results from the drilling and trenching programs are being incorporated on an ongoing basis to target additional drilling. Mr. Lukas Lundin, President and CEO of Fortress, commented, "We're very pleased to see these additional encouraging results from the Amy target at Svetloye. Amy is quickly shaping up to be another strong prospect along with Elena. I look forward to seeing further results as the 2008 drill program continues." In the nine prospects identified to-date within the Svetloye License, gold is associated with extensive zones of vuggy silica, quartz-alunite and quartz-dickite-kaolinite alteration. This style of mineralization is common to Pierina, Veladero and other high sulphidation epithermal deposits. James C. Ashleman, Chief Geologist and a Qualified Person as defined by National Instrument 43-101, has reviewed and verified the technical information contained in this news release. A rigorous quality control program has been instituted involving insertion of certified standards, duplicate sampling and check assaying. Samples are crushed and split on site with final sample preparation at the Irgiredmet Laboratory of Irkutsk, Russia (accredited by the State Committee of the Russian Federation for Standardization and Metrology "Gosstandart" of Russia) and by ALS Chemex in Vancouver. Assaying by fire assay is performed by the Irgiredmet Laboratory and by ALS Chemex in Vancouver, Canada.